Looking for ways to teach geology to your students? We’ve developed the following lesson plans to assist (more to come). Help students learn firsthand about the connection between surface water and groundwater. Using a plastic shoebox, sand, and a turkey baster, students will see how water enters and moves through an aquifer. 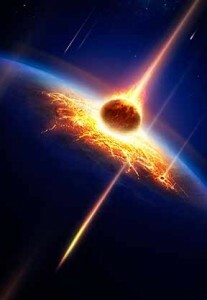 Getting hit by a meteorite—what are the odds? Using a beach ball globe, a piece of paper, and a calculator, students gather data on the likelihood of getting hit by a meteorite. This lesson plan helps students understand the scientific method by creating and using a model, formulating a hypothesis, collecting data, and testing predictions. 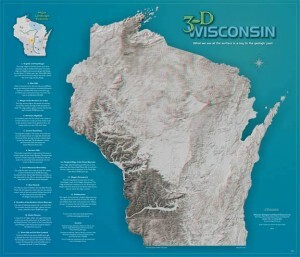 Wearing a pair of 3-D glasses, students view the 3-D Wisconsin map and write down distinctive landscape features. Working from the list and the map key, the group puts names to features. 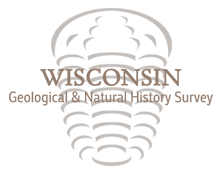 Learn more about the state’s landscape features from our website and from resources listed in the lesson plan. In this two-part lesson plan, students create a three-dimensional model of the rocks beneath Milwaukee using real Wisconsin rock samples. To help them grasp deep time, they then build a rock timeline showing when each of the layers was deposited. 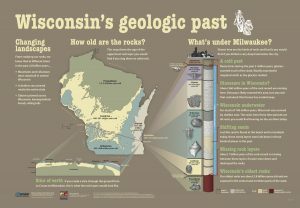 Uses Wisconsin’s Geologic Past poster, one or more student rock kits, and a rope (or toilet paper).